My 2nd lesson: People love dogs. As long as they’re cute, convenient, and easy-to-care-for. Senior dogs require extra care. Doesn’t matter what time of year or what day of the week. On any given afternoon, there all always more dogs in the Intake building than I have time to visit. Today I focus solely on the Pit Bulls, and even then, there are still too many to attend to. The assortment is striking, from young pups to old geezers, from needy to shy to outgoing to hyperactive. Two have come in together, both pretty beat up. It isn’t clear whether they’d been made to fight or had just gotten into a scrap somewhere along the way. One has the saddest eyes I’ve ever seen — and a golf ball sized tumor on his hind leg. Not far down the run is another pair, arrived attached at the hip. One’s ears are clipped, but neither looked malnourished, nor like they’d been forced to fight, thankfully. And in the next run over, I play “find it” and “stretch” with an orange pup in a pink collar. Clearly she’d had a home. By the looks of her, she’d been at least adequately cared for. So where is her owner? 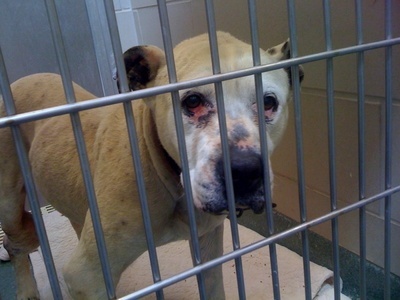 By the time I reach the Pit Bull/Shar Pei mix on the far end of the runs, it’s nearly the end of my shift. We go for a quick session in the park, off leash, and it does us both good to play chase in the sun. I leave her in her kennel with a tennis ball and a peanut butter Kong. It makes shutting the door only slightly less heart-wrenching. Pet overpopulation: real or myth? While no one disputes the fact that millions of animals are put down each year, the No Kill movement asserts that pet overpopulation is a myth. Shelter administrators, on the other hand, claim crippling numbers of dogs and cats are overloading their facilities, that we have a serious pet overpopulation problem. In a way, they’re both right. There are more people who want to bring an animal into their home than are animals available in shelters. Each year, Americans take in seventeen million pets while there are “only” eight million animals in shelters. So why don’t these figures add up to empty shelters? Why are approximately ten thousand animals put down every single day? The fact is, many people don’t want shelter dogs and cats. Or at least think they don’t. Sadly, only about a quarter of the pet-acquiring population goes to a shelter to find their animal. The rest buy from breeders and pet stores — or acquire them from friends and family members whose pets have had litters. The particular population of animals that people want is not the same population of animals available in overwhelming numbers. So, when we speak of companion animals as a whole, we have a surplus of shelter animals with regards to supply and demand. In that sense, overpopulation is real. Painfully real. If we shifted the public’s perception of what they think they wanted, this wouldn’t have to be. If people understood that a shelter dog is no different from a breeder dog — an adopted animal will provide the same amount of joy, love, and satisfaction as a purchased animal — we could solve this problem right now. Overpopulation could become a myth today. Read previous installment: No Kill is a complicated “simple” concept.